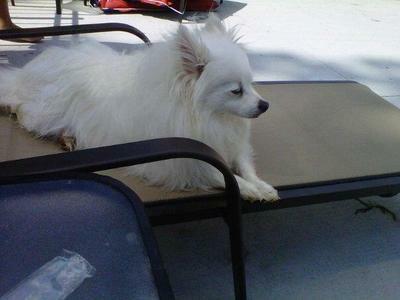 I have a female Eskie named Lexi Isis. She attends weekly agility classes and loves to be around other dogs and people. She is great with kids and loves to go for car rides. She is very smart but does have a stubborn streak so we work on that. She gets along with our 4 yr old male cat Peyton and the dogs in her agility class (except 4 a female Border Collie named Erran). Erran doesn't like Lexi to look her in the eye. She is a great dog but requires lots of brushing. She sheds really bad twice per year. She loves to get in our pool and lays on the steps taking an occasional swim. She doesn't like a bath or getting brushed or getting her nails cut but she lets me do it. And then runs into the arms of my husband; someone who can save her. She is a good watchdog. Nothing gets by her. This can be a problem because she can bark. We are working on this too to cut down on it. She is my baby....another member of the family just like my 2 legged kids. In 5 weeks she has a baby sister of the 4 legged variety coming home. Another Eskie. We are all going to pick her up. That's my plan to make her feel included. I have a SUV so Lexi up front and Kaya in the back with my daughter. I'm sure it will be an ADVENTURE! Lexi looks like a movie star! Your picture of Lexi makes her look like she is on a movie set. Maybe it's the swim she just took in your pool. All she needs is some cool sunglasses!